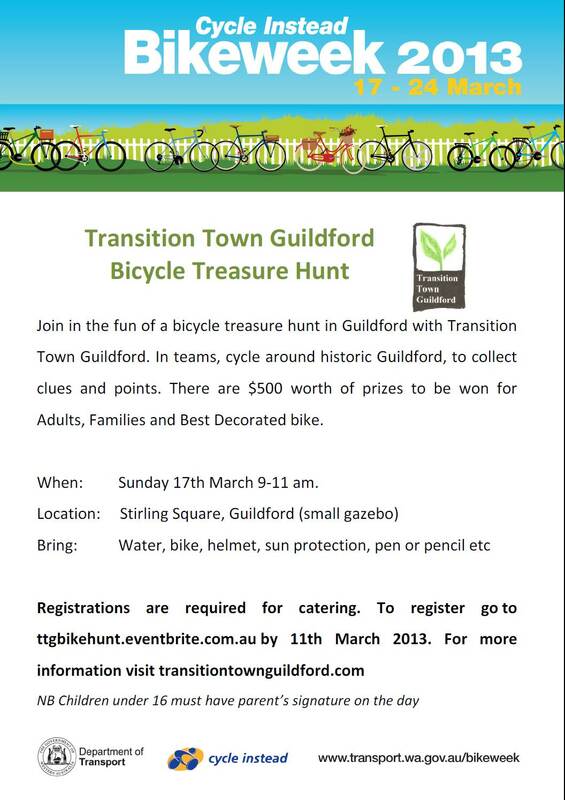 As part of Cycle Instead bikeweek 2013, Transition Town Guildford are holding a Bicycle Treasure Hunt. Participants will cycle around historic Guildford in teams to decipher clues, collect answers and earn points to win prizes. Bike shop vouchers worth $500 will be awarded in the categories of Adults, Families and Best decorated bike. Children under 16 years of age must be accompanied by a responsible adult to sign a waiver on the day. Individuals participating in these events do so at their own risk. This event is supported by the Department of Transport as part of Cycle Instead Bikeweek 2013. This entry was posted in Event, Transport and tagged Bike week, Cycle, department of transport, guildford, transportation. Bookmark the permalink.